Outdoor blinds continue to grow in popularity among homeowners and builders. They add elegance and function to the exterior of the home as well as keep the interior cool and comfortable. 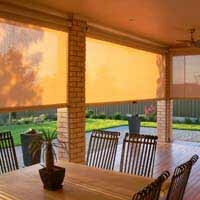 With our industry partnership with Pinz Blinds, Outside Concepts can provide a massive range of outdoor blinds and awnings for your home or business. Our range includes track-guided blinds as well as motorised blinds that raise and lower with the press of a button. Outside Concepts offers only the highest quality materials that are custom designed to match your home to the exact measurement. Outside Concepts have a great range of styles and materials for you to choose from for your outdoor blinds. We offer a free, no-obligation quote to get you started. Our design experts are looking forward to speaking with you on how they can fit outdoor blinds to your home’s windows. Outside Concepts are proud to be able to supply and fit ZipTrak Outdoor PVC Blinds. Outside Concepts is the leader in exterior home improvements. We have proudly served Australian homeowners and families since 1991. Our reputation and commitment to excellence speaks for itself. Contact Us to speak to a friendly and knowledgeable customer service representative about how we can help you today. We offer the full range of outdoor projects, including outdoor blinds, carports, pergolas, patios, and more. Come and visit one of our many showrooms throughout Australia. Or give us a call toll-free at 1 800 601 674 to get started today. We will prepare a free, no-obligation quote for your custom designed pergola.